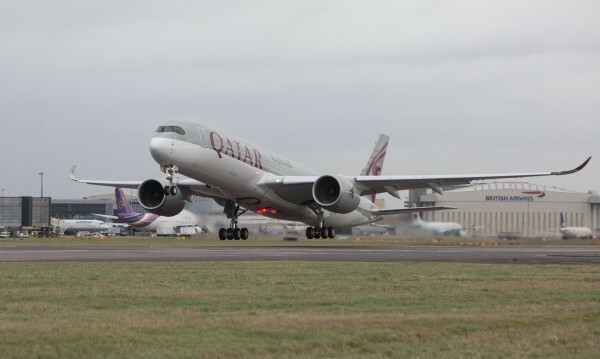 Last Thursday (15 January) Qatar Airways introduced the Airbus A350-900 XWB into scheduled airline service with the return flight from Doha to Frankfurt. When a second aircraft is delivered in March both the airline’s daily flights on the route will be by A350. Your Editor is lucky, now having flown twice on the A350, firstly what must be considered ‘a bun fight’ out of Toulouse, a very short Airbus organised sector, full of journalists and local politicians, with not a spare seat to be found. This was followed by a somewhat calmer two-hour flight from Heathrow just a week ago (5 January), the aircraft not very full, and the whole operation under the calmer control of Qatar Airways. This report reflects the Heathrow experience, hosted at Heathrow’s Royal Suite near Terminal 4, not as luxurious (plain would be a better word) as Qatar's own superb lounge in T4, but with direct apron access to the aircraft, and passengers immediately landside upon return. A full security check of course. Matt Gorman, Director of Sustainability at Heathrow Airport, briefed us on noise aspects of the aircraft pointing out the 90% reduction in the footprint since the 1970s. The A350 has the automatic Noise Abatement Departure Procedure that reduces thrust automatically after take-off in order to reduce noise while flying over inhabited areas around airports. The Rolls-Royce powered aircraft is 16% quieter than the current dB requirements. First impressions count. The aircraft seems wide but in fact is 11" less than a Boeing 777. The secret in Business Class is the lack of central overhead bins. Coupled with mood lighting and large windows (with electromechanical shades) the cabin feels light and airy. This was to be a non-catered flight (with the exception of canapés and Champagne), but if previous Qatar experiences are anything to go by the Doha-based airline will set another new standard. In one sense the cabin is not First Class, no private suites, but for sheer spaciousness and comfort it is a quantum leap in comfort in the air, far superior to most competitors’ premium offering. The A350-900 XWB comprises a two-class configuration with 36 Business Class seats in a 1+2+1 configuration. The cabin is split into two with a standing lounge area after row eight, and three more rows before the curtain. The galley is in the front. There are four decent sized rest rooms. The cabin is pressurised to 6,000ft rather than the 10,000ft with previous generation aircraft. This should mean a less tiring journey for passengers. Economy Class comprises of 247 seats, each 18" wide in a 3+3+3 configuration, with up to a 32" pitch. Each individual Economy seat features a 10.6” in-flight entertainment screen, and more space at shoulder level for passengers in window seats, thanks to a vertical side wall panel design. There is an argument that 2+5+2 is a better arrangement as this leaves only one seat with the problem of getting over the pair on either side. The layout certainly looks spacious. Some carriers will go for 3+4+3 and offer narrower seats. Akbar Al Baker, CEO of Qatar Airways, is very much a ‘hands on boss’. Now nearly 20 years with the airline he has always been a regular traveller and clearly knows what he, and his business travel customers, want. He has not always got it right but this latest Qatar Airways Business Class cabin has an extraordinary amount of space and will surely prove ideal, particularly on very long haul flights, for those who want to work on the aircraft. The seat width is 22" and 80" as a fully flat bed. Most airlines’ Business Class are in the 73"/75" in range. There is a set of very simple controls which includes a button for the aisle arm rest which goes down for landing and cleverly includes storage for a water bottle and the Giorgio Armani amenity kit. Sleeper suits are also provided on scheduled services. There is ample shoe storage space. Table space is no problem. A two piece unit comes out from under the 17" HD touch screen. It is very firm and easily large enough to lay out the meal or to put a large laptop. Two other flat surfaces are provided. With the twin central pair there is a dividing screen that requires just the right amount of pressure to spring up. Also provided is a proper three-pin multinational plug plus USB and Apple ports. There is a reading light too. 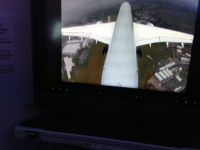 Some criticism and that concerns the IFE system featuring 17" high-definition (HD) in-flight entertainment screens (IFE). The handset is not the easiest to use. The Oryx video selection covers more than 1,000 options. The wi-fi, GPS and GPRS is by On Air but was switched off for this special flight. What the system does not provide is live TV and with it up to date news and sport. Even the low-cost carriers now offer this for free (Jet Blue and Norwegian). This absent service is missed and needs looking into by Qatar Airways. Our flight took around two hours and included low level flyovers at Filton – Bristol (4,000 Airbus employees) and Broughton – Chester (6,000 staff), where once the Comet was built. Qatar Airways has 80 A350s on order including 37 of the larger and longer range -1000 model. To date it has taken 18 of the smaller Boeing 787 Dreamliners with 60 the final total at present. If you then consider it has also ordered 50 Boeing 777X the airline’s ambitions are very clear.